Stanley Black & Decker (NYSE: SWK), New Britain, CT, has acquired CRC-Evans International (“CRC-Evans”) for $445 million in cash. Based in Houston, Texas, CRC-Evans is a leading global supplier of specialized tools, equipment and services for the construction of oil and natural gas transmission pipelines. 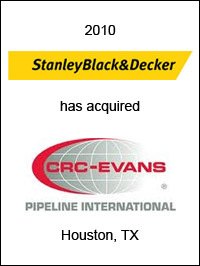 With fiscal 2010 revenues of approximately $250 million, CRC-Evans immediately establishes a scalable, global growth vehicle for Stanley Black & Decker to capitalize on favorable end-market trends in the oil and gas infrastructure area. EC Mergers & Acquisitions acted as financial advisor to Stanley Black & Decker on this transaction.